Tax-deferred and tax-advantaged are two terms often used interchangeably and, as a result, often lead to a lot of confusion; but, the difference can be significant in planning how you will be drawing income from your nest-egg during your retirement years. The key, of course, is to discover your options and do advance planning. Tax-deferred investing is familiar to us. Many employers match employee contributions up to a certain dollar amount to a company-sponsored retirement account, which usually offers tax-deferred growth. 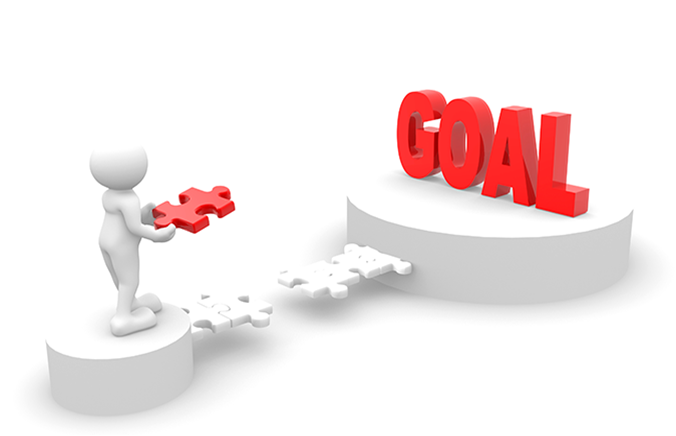 Contributing to your account up to the employer match is a significant first step to retirement success. However, many have found that their company-sponsored plan has proven inadequate due to contribution limits and other factors. Most investors would likely be well served seeking out other sources of tax-advantaged retirement funds. 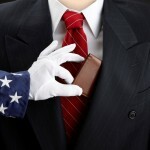 When used properly, tax-advantaged money is taxed up-front when earned, but not when withdrawn. This approach may seem costly; but, that view may very well be short-sighted and far more costly. What if Mitch and Laura had balanced their portfolio with a tax-advantaged funding source? What if they could pull the first $30,000 from the tax-advantaged source and the rest ($27,777) from the tax-deferred source? What would that look like? Because Mitch and Laura balanced their portfolio, they saved $11,667 each year during retirement – almost 24% of their year’s living expenses each year! Simple math reveals a savings of over $116,000 during ten years of retirement; and it they’re retired for 30 years, as many are, the savings is over $350,000, not counting what they could have made by leaving the money invested – which could be rather substantial: At just 3.5% annualized, the total would come to over $600,000! Most savings plans, including employer-sponsored retirement plans, are dependent upon someone actually continuing to work and actively contributing to the plan. 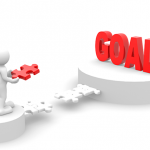 If work and contributions stop, the plan does not complete itself. It’s been my experience that relatively few individual investors have self-completing retirement plans, while a rather large percentage of high net-worth investors do. It can ‘self-complete’ a retirement plan – and it doesn’t matter if the individual dies early or lives a long life. Few people realize they can win either way. As I said, stocks, bonds, real estate, commodities, and company retirement accounts simply can’t match it; but, the design must be customized. If you’d like to learn more about this and other smart retirement strategies, feel free to contact me. *This has always been a source of misunderstanding for many individual investors: The fact is not all the money in Mitch and Laura’s retirement account belongs to them. Their retirement account might show a $500,000 balance, for example, leading them to believe they have $500,000. The truth is less comforting. The truth is, given a 28% tax-bracket, that $140,000 of that money belongs to the government, not Mitch and Laura. They’ll likely never see it. Their real balance – the one the statement doesn’t show them – is $360,000; and, as we’ve seen, they’ll need to draw-down $69,444 each year to meet their needs. How long do you think that money will last? … and what it means to your retirement income – particularly your Social Security taxation in retirement. 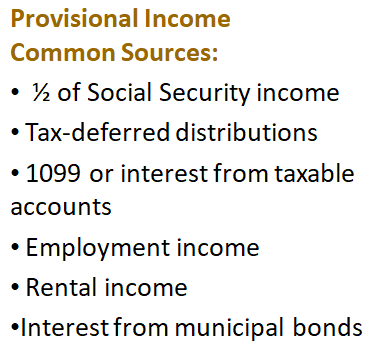 Most people believe that municipal bond interest is tax-free and won’t affect taxation on their retirement income. 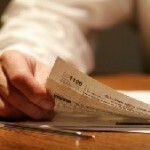 Well, it is, I guess; but, there are tax ramifications few people have heard about. It’s called “provisional income”. There are categories of income which, when added up, determine how much provisional income you’ve received in a given year. And, during retirement, when you’re likely receiving Social Security income, the amount of provisional income you receive determines just how much you’ll pay in taxes on your Social Security Income. As you can see, when adding up your provisional income, it begins with 50% of your Social Security income. Then they add in all distributions from tax-deferred accounts. 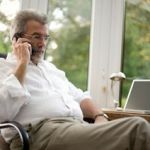 If you’re in retirement, that includes money you’re taking from your 401(k) or IRAs (except distributions from a Roth IRA, which are generally tax-free, and any money you’ve taken from a properly-structured permanent life insurance policy (withdrawals up to your cost-basis and policy loans). And, as you can see, municipal bond interest is counted. 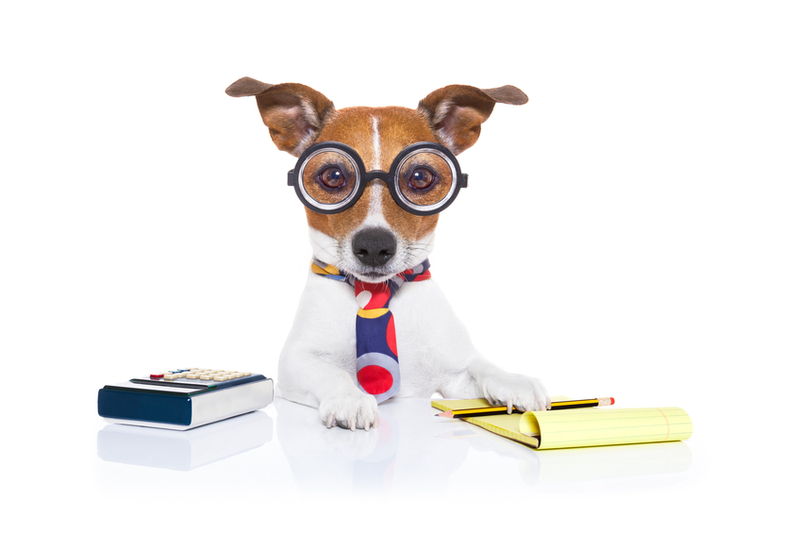 Once you’ve added up all your provisional income, how much do you owe in taxes? Well, it depends. 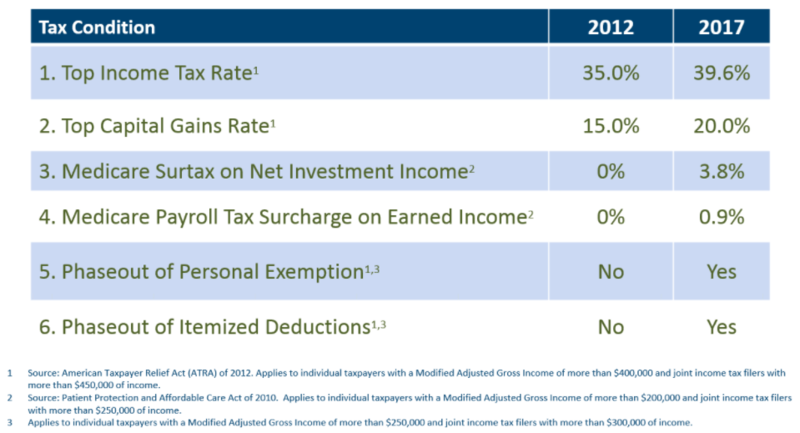 Here are the provisional income thresholds. If you’re a married couple and your provisional income is below $32,000 for the tax year, you will pay no txes on your Social Security income. If your income is over $44,000, however, then 85% of your Social Security income will be taxable. The whole idea was part of a package passed back in the 1980s to save Social Security. One thing they didn’t do: index it for inflation. So, as your 401(k) grows and your assets grow—more importantly, as inflation continues through the years and it will require greater withdrawals for you to live in retirement—the greater the likelihood you’ll be paying taxes on your Social Security. It doesn’t take much to get past $44,000 in retirement. Let’s take a quick look at an example: Fred and Wilma. They have $30,000 in combined Social Security income and also take $40,000 annually from their IRAs, giving them a $70,000 income in retirement. For computing their provisional income, only half of their Social Security income is used. 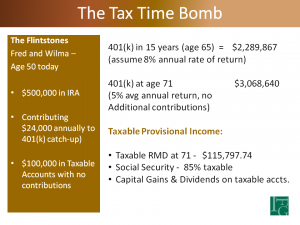 Added to their IRA distributions, they have $55,000 in provisional income, meaning that 85% of their Social Security income ($25,500) is taxable at their tax rate. If they’re paying taxes at 30%, their tax bill will be $7,650. But if they need the entire $70,000 they’ve taken as income, they’ll have to take an additional distribution just to pay the tax bill, and, oh yes, it’s taxable, too. But, Fred and Wilma have another problem they’re likely completely unaware of. There’s a ticking time-bomb growing inside their 401(k). It’s growing. If Fred’s 401(k) continues to grow at an 8% average annual rate until he’s 65, he’ll have a balance of over $2 million! And, at age 71, when he’ll be required to take required minimum distributions (RMDs), his balance will be over $3 million—requiring RMDs of over $115,000 annually. Fred and Wilma will be paying a lot of taxes. And, as mentioned earlier, the long-term outlook for taxes isn’t likely very good. Just take a look at the differences from 2012 to 2017. 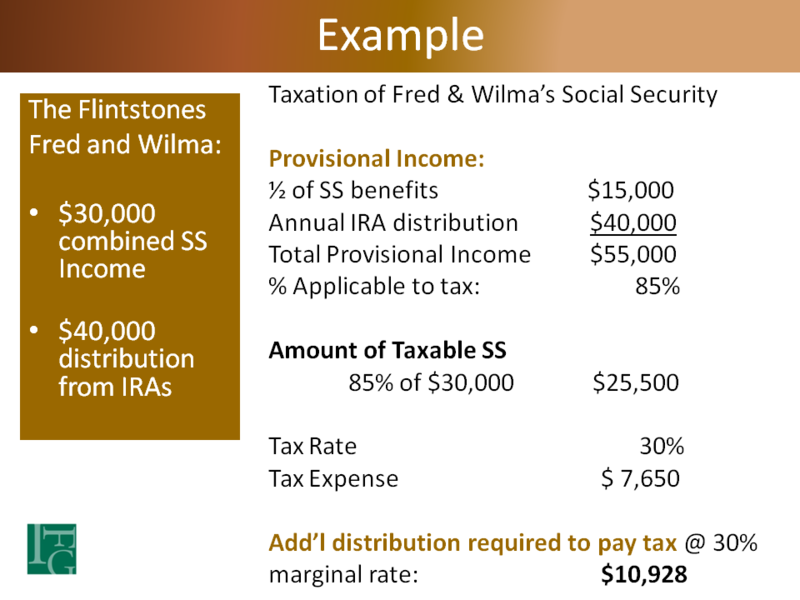 How can Fred and Wilma mitigate, and maybe eliminate, their income tax payments in retirement? Under current tax law, each has a personal exemption of $4,050, so they have $8,100 in combined personal exemptions. They also have their deductions. If they’re using the standard deduction, they’ll have $12,700 too, giving them a total of $20,800 in exemptions and deductions. So, their key is to keep their taxable income below $20,800. All income above the standard deduction and personal exemption is subject to tax. The good news is that Fred and Wilma are still in their 50s and there’s plenty of time to plan. 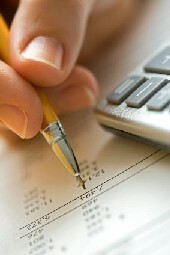 Working with their Certified Financial Planner®professional, they can begin “reverse –engineering” the placement of assets in a way they can still grow their nest-egg, but re-arrange their ‘tax buckets’ so Uncle Sam becomes less of a partner—or no partner at all, which would be the ideal making their tax-jockeying a moot issue. 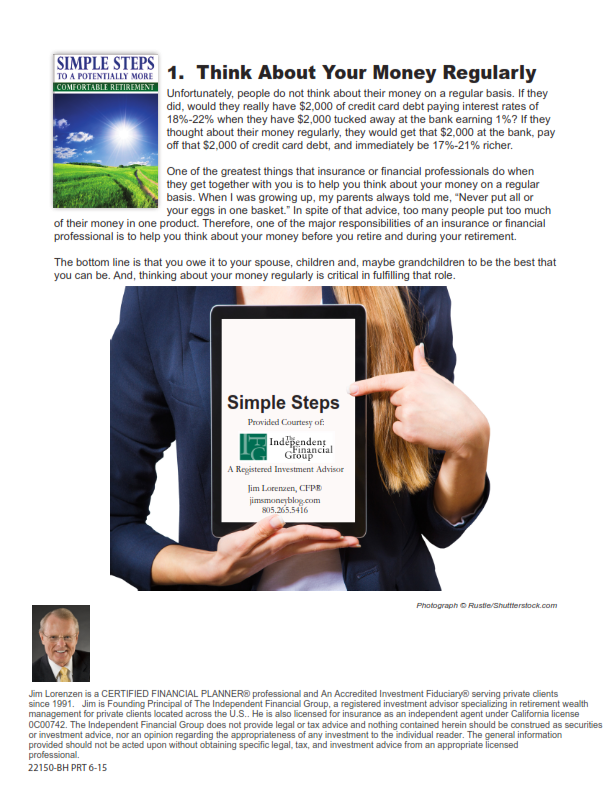 You can get our piece on 4 Steps to a Tax-Free Retirement. I think you’ll like it. Bad decisions = bad consequences = big costs! As you may have seen or heard me say many times, it’s not wise to act first and plan later; yet, that’s exactly what I’ve seen people do time and again over the last twenty-five years. As you can imagine, I’ve seen a few mistakes. 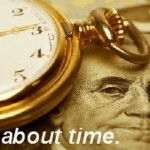 That applies to rollover decisions, as well as other decisions regarding 401(k) and other retirement account assets. You might enjoy seeing a short video on one big mistake many people make – and you can also get access to some additional resources and a rollover checklist I think you’ll find useful. You can find it all here. Leave money in the qualified plan if retiring between ages 55 and 59½ and distributions are required.Since there is no penalty on withdrawals from a qualified plan after attainment of age 55 and separation from service (age 50 for qualified public safety employees), distributions are more liberal than if funds are rolled to an IRA. 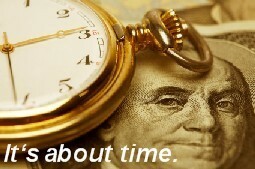 Once funds are rolled to an IRA, there is generally a penalty for withdrawals prior to age 59½. Therefore, it’s best for people who need money from their retirement account in this age bracket to leave the money as is, in their company retirement plan.Often, people who have already completed their rollover are younger than age 59½ and need a distribution. In these cases, they can use rule 72(t) to avoid penalties. When they do this, it’s best to split the IRA into pieces for maximum benefit.Each IRA stands on its own, which means that taking 72(t) distributions from one account has no effect on the others. Therefore, if one IRA produces more income than is needed when placed on 72(t) distributions, you could split the IRA into more than one account, and use one of the smaller accounts to make your withdrawals. I am not a CPA or an attorney; so, check with the appropriate advisors.And in the future, if you need more income, you could begin equal distributions from another account as well. This could provide greater flexibility in meeting your immediate and future income requirements if under age 59½. Make optimal use of creditor protectionSome IRA owners and financial advisors think that the recent changes to the federal bankruptcy rules automatically protect IRAs. That is not true. 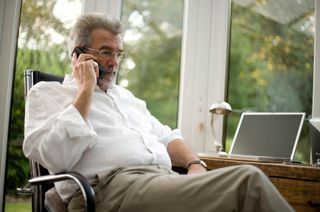 For creditor protection purposes, an individual would be wise to leave his funds in his qualified plan because ERISA gives complete creditor protection to qualified plans (note that one person qualified plans do not receive the protection—there needs to be at least one “real” employee in the plan). If the individual does roll over his qualified plan into an IRA, it is optimal to leave these funds in a separate rollover IRA, because the protection that the funds had under ERISA will follow the funds into the rollover IRA. Re-Check Your BeneficiariesA company retirement plan (a qualified plan) is governed by the ERISA rules. And those rules state that you must name your spouse as a beneficiary or get spousal consent to name another person. The same rules do not apply to IRAs.Remember this all important rule—whoever you name as beneficiaries on your IRA account will inherit your IRA. Your will or living trust has no control over your IRA, so make sure your IRA beneficiaries are exactly as you desire. Get a check from the companyOf course, this is just foolish. The company must withhold 20% from the payment, so that a person with a $100,000 account will have $20,000 withheld, and will receive a check for $80,000. In order to complete a tax-free rollover, the taxpayer must deposit that $80,000 in an IRA plus $20,000 from their pocket to complete a tax-free $100,000 rollover.The taxpayer may eventually get the $20,000 withheld as a tax refund the following year, but that will not help their cash flow, as they need to complete their IRA rollover within 60 days of receiving the check from their qualified plan.The bottom line is that people should never touch their qualified funds. The only sensible way to move funds is a direct transfer from the qualified plan to the IRA custodian and avoid withholding. Rollover company stockShares of employer stock get special tax treatment, and in many cases, it may be fine to ignore this special status and roll the shares to an IRA. This would be true when the amount of employer stock is small, or the basis of the shares is high relative to the current market value.However, if you have large amounts of shares or low basis, it might be a very costly mistake not to use the Net Unrealized Appreciation (NUA) Rules. If your company retirement account includes highly appreciated company stock, one option is to withdraw the stock, pay tax on it now, and roll the balance of the plan assets to an IRA. 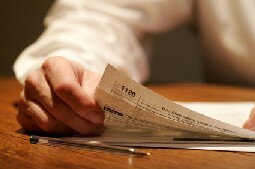 This way you will pay no current tax on the Net Unrealized Appreciation (NUA), or on the amount rolled over to the IRA. 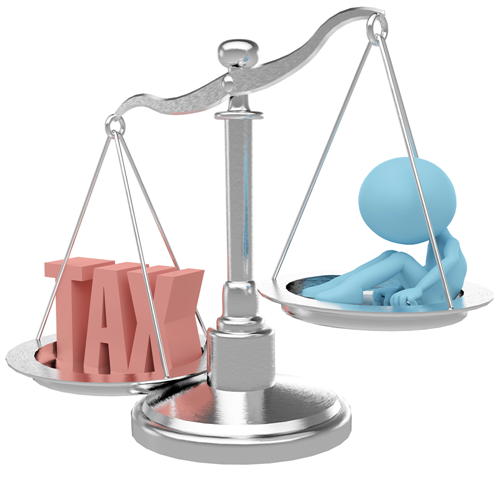 The only tax you pay now would be on the cost of the stock (the basis) when acquired by the plan.By the way, if you withdraw the stock and are under 55 years old, you have to pay a 10% penalty (the penalty is applied only to the amount that is taxable).For more information on NUA, get our complete report on the Six Best and Worst IRA Rollover Decisions. You can do that here. Click here for your report! Don’t forget the video, resources and checklist, which you can access here. And, don’t forget the report! 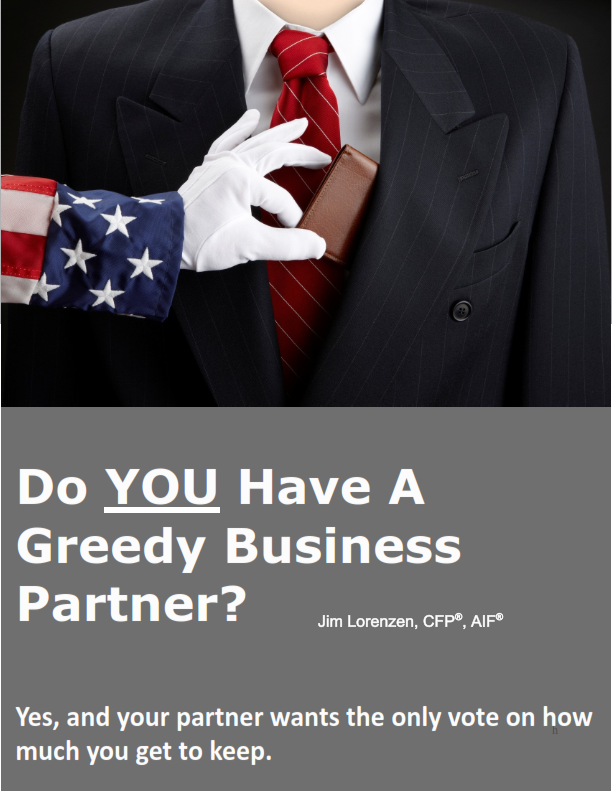 Do You Have A Greedy Business Partner – Even if you don’t own a business. 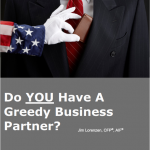 If you work, you have a business partner, even if you don’t own a business. And, this partner isn’t like most others. The problem is your partner in the business of life gets to decide how much of your revenue he wants to take… and you have no vote. In fact, he can – and will – change his mind at any time at any time, including during your retirement years. What can you do? You might find this special report helpful. Scott and Linda (not their real names) are in their 50s and have done a lot of things right: They’ve worked hard, saved and invested, and they’ve been practical in their spending. Inflation and longevity: They know what’s happened to their purchasing power over the last 30 years. They’re concerned about the next 30+ (maybe 40) when they’re living off their investments. 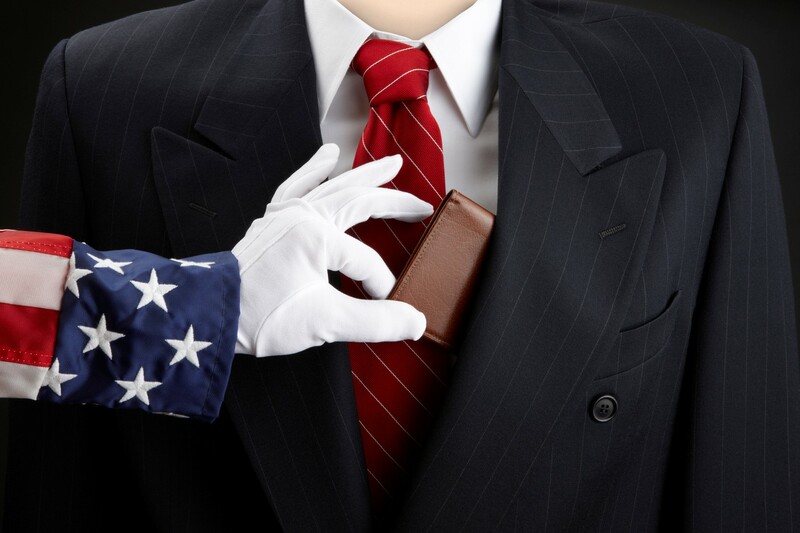 Taxes: While there may be a temporary reduction coming now, they also know the U.S. is facing a $20 trillion debt and there will be 7 or more presidential elections – not to mention 15 congressional elections – that will take place in the next 30 years. That spells a lot of potential changes and changes in tax laws. They want old-age income that will be protected from the politicians. Health costs: A huge wild-card. They know the odds are about 50% one of them will need it, but they don’t want to see long-term-care insurance money going down the drain if they don’t need it. They also want money available if they do have a chronic illness. Liquidity: They want money available for emergencies during retirement without having to jump through a ton of hoops. I thought you might like seeing a sample case study about how one couple addressed this issue. Planning to Roll Your 401(k) to Your Own IRA? Getting ready to retire? Planning to roll your 401(k) into your own IRA? It will pay to do your homework first. To help you get started, you might find our 401(k) Rollover Review helpful. It contains information on changing jobs, retiring, methods, rollover taxation issues, and more. 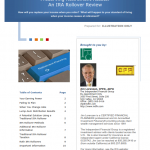 Click Here for your 401(k) Rollover Review! Tax-Advantaged is Better than Tax-Deferred! Do you know the difference? Many employers match employee contributions up to a certain dollar amount to a company-sponsored retirement account, which usually offers tax-deferred growth. 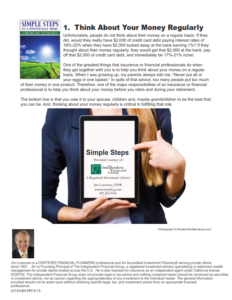 Contributing to your account up to the employer match is a significant first step to retirement success. TO ROLL? OR, NOT TO ROLL…. Getting ready to pull the retirement cord? In a previous post, I had talked about pension options – worth reviewing if that’s an issue for you. 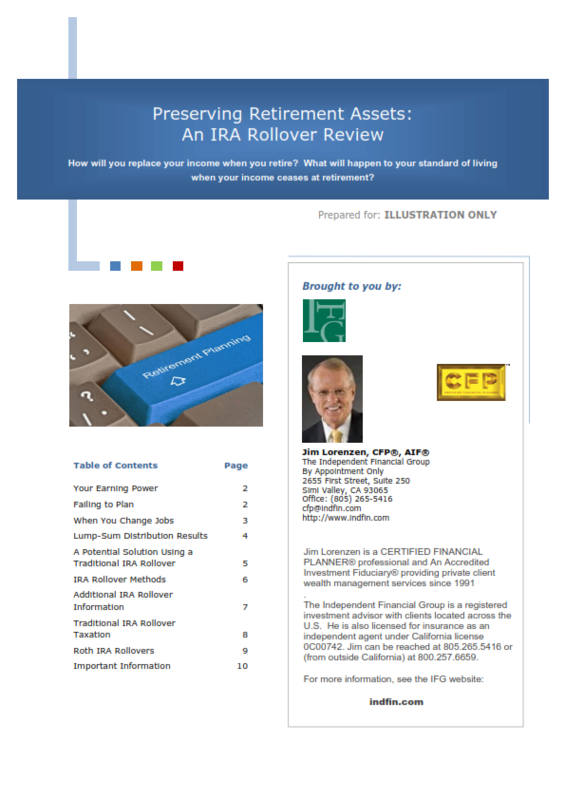 I also recently provided an IRA rollover checklist for those evaluating the pros and cons of such a decision. Whether or not to to do a rollover is not a simple ‘yes’ or ‘no’ question. It depends on your particular situation. There are good reasons both for and against rolling over your retirement plan to an IRA – the checklist can help sort those out. Believe it or not, there may be a reason to take some of your retirement out in cash and pay taxes right now! How can that be? 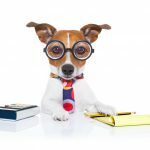 If you’re on of those now doing your homework – good for you – you may enjoy reading this report, Six Best and Worst IRA Rollover Decisions. This report not only discusses those decisions, it will also provide some insight on additional issues worth considering. I hope you find it worthwhile. You can download it here> Click here for your report! The US Supreme court ruled this past June, in Clark v. Rameker, that inherited IRAs are NOT protected from a beneficiaries’ bankruptcy. Previously, this was an open issue. Now, the only way to protect an inherited IRA from inclusion in the beneficiaries’ bankruptcy, is to have a correctly worded IRA Inheritance Trust named as the beneficiary. This will also protect the IRA principal from other creditors, or divorce proceedings. However, if the distributions are paid directly to the beneficiary, they are NOT protected from bankruptcy or even attack in the event of a divorce. An IRA Inheritance Trust which also protects distributions from attack is called an “accumulation trust.” The trustee cannot be the child. The trustee has full discretion to hold distributions from the IRA in trust to protect the child or pass them out, depending on the circumstances. 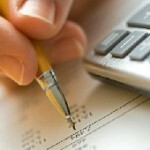 The child beneficiary may benefit from the distributed assets that the trust holds, but does not own them individually. Obviously, if the child-beneficiary has no title or control of the IRA distributions, they cannot be taken by a charging order or other legal means of attack. Hope you find that helpful. And, don’t forget to download your report.